This screenshot from the documentary "Who Killed Vincent Chin?" 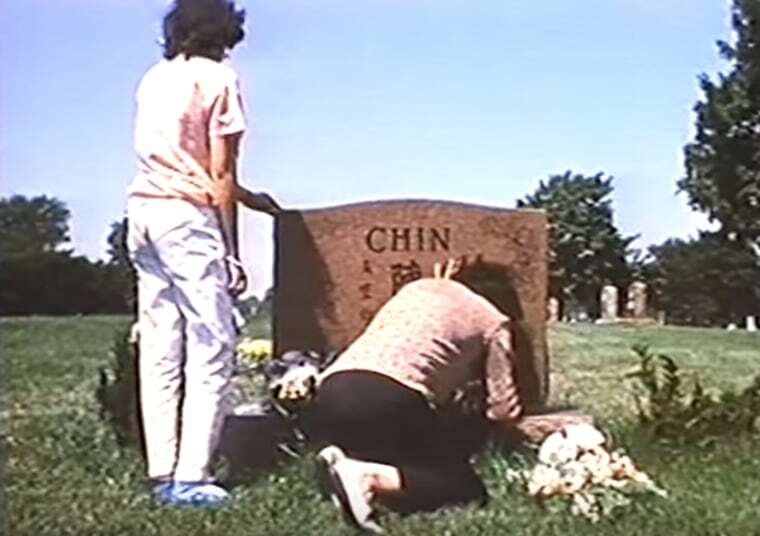 shows Chin's family at his grave.Courtesy of "Who Killed Vincent Chin?" The Vincent Chin estate hopes the fact that Ronald Ebens was responsible for the death of Chin will help sway a Nevada judge to rule against a motion requesting the removal of a lien from Ebens' home. In 1982, Ebens “murdered Vincent Chin in cold blood by beating him repeatedly over the head with a baseball bat,” reads a document filed by the estate in December in a Nevada Court. It goes on to list several procedural arguments against the motion. The lien on Ebens' Nevada home, valued modestly at under $150,000, was placed to protect the interest of the Chin estate, which was awarded $1.5 million in a wrongful death civil judgment that has since ballooned to more than $8 million with interest. After three decades, Tomich sees Ebens’ motion to remove the lien as an opportunity for a public reminder of what the case represented to Asian Americans. “Chin is to Asian Americans’ civil rights what Dr. Martin Luther King, Jr. is to the civil rights of African Americans,” the court filing reads. The document also describes Ebens as “desperate to continue his evasion of responsibility and enjoy what remains of his infamous life." "Just as he has ignored the strictures of the justice system over the past three decades, so too does [Ebens] here, with this procedurally defective motion and its numerous improper requests for relief,” it continues. Ebens claims the lien prevents him from selling or refinancing the house. The Chin estate is worried that this is his one major asset. Without the lien, Ebens could deplete the asset while alive, leaving the estate with nothing to make up for the millions it is owed. “We’re positioning ourselves for his demise because justice needs to be served,” Tomich said. Now that motions have been filed by both sides, the Nevada court is expected to post a decision by Jan. 4.